You aren't the only one who might feel frazzled by the hustle and bustle of the holiday season. 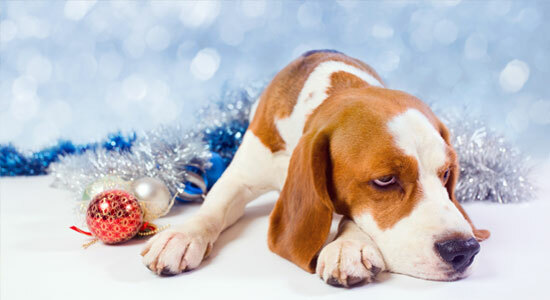 The winter holidays can also put stress on the family dog, and this can potentially lead to dog bites. From a dog's point of view, crowded holiday parties consist of strange faces, excited children, and changes to their routine. All of these factors can make a dog quite anxious, which could lead to an unfortunate biting incident or a serious injury. Even a typically calm dog can act out if it feels uneasy in an unfamiliar situation. Dog bites are not a rare occurrence either, with nearly 4.7 million victims of dog bites each year. Half of all dog bite victims are children. In 2012, dog bites accounted for more than one third of the settlements of all homeowners insurance liability claims, indicating that homeowners regularly encounter these types of situations. Pennsylvania, the state with the fifth most dog bite insurance claims, had 165 dog bite claims last year. One concern is that pet owners may want dogs to act hostile towards burglars and home invaders, but do not properly train their dogs how to act around invited guests. If you host a gathering at your home this holiday season, make sure that your dog will not be put in a stressful situation which may cause them to act unpredictably. For more information on dog bite prevention, visit our Dog Safety Resource Center. Were You or a Loved One Injured in an Attack by a Dog? Did you, or your child, suffer serious injuries when a dog attacked you? Do you now have scars that make you feel self-conscious and embarrassed? Has your life changed because of your dog bite injuries? If so, you may need a dog bite lawyer and you may have a case. But, there's only one way to find out. Call 1-866-943-3427, or use our free legal consultation to get answers to your dog bite legal questions, learn your legal rights, and find out if you have a dog bite case. Source: “Family Dog Can be a Grinch During Holidays.” Pittsburgh Post-Gazette. November 20, 2013.